I was recently at an event for mid to senior level women managers to discuss what it takes for women to lead. I started off my session by asking how many women present there wanted their bosses’ job. Of the 100 plus women in room, only around 30 raised their hands. When questioned, most of the remaining 70% felt that they were not ready to move up as they did not have the capabilities. When questioned further most admitted that they were not sure whether they had the capabilities or not and hence were unwilling to raise their hands. Indeed the path up the corporate ladder is not an easy one, especially if you are wearing high heels. It’s strewn with challenges, be it dealing with stereotype mindsets about women, struggles in juggling family and work life, unequal pay etc. But it is definitely not impossible to move up. So what stops women from climbing up the corporate ladder? A lot has to do with our own beliefs and doubts. More often than not, we hold ourselves back fearing that we are not ready for it. To me the elephant in the room is primarily the one in our heads. From the time we are born, most of us hear that we need to be great wives and great mothers and we grow up believing that it is the “ROLE” of a perfect woman. As a result, when we decide to stray from the ‘defined’ path, self-doubt and guilt takes over. Are we really capable? Are we being fair to our families? Are we being fair to our employers? Is it OK to want more professionally or will that make me ambitious? Is ambition a bad thing? As a woman, I have had my own demons to fight. There is unfortunately no recipe that can be followed to fix the problem. But, based on my journey to date and learning, am sharing below a few things we can do to overcome some of these doubts and get rid of the demons in our heads. 1. Be sure about what you want. My mother was a brilliant teacher. However, once we were born, she chose to become a fulltime housewife because that is what she wanted. And not only was she great at it, but she was happy and fulfilled in what she was doing. All of us are designed differently. We have different dreams and aspirations. Be honest with yourself and decide what makes you happy in life. There is no right or wrong answer here. 2. If you dream of a career, then be open and honest with your family. Especially with your husband, set the right expectations. It is amazing how many young girls today agree to marriage without knowing if their spouse will support their decision to have a career of not. Marriage is one of the most important career decisions one makes. So if you dream of a career and professional success be serious about it and talk to the people in your life to set the right expectations. This also helps you build the much needed support system, which is a must for every working woman. 3. Identify the tradeoffs you are ok to make and make peace with them. The definition of a “perfect woman’ is a moving target and it differs from woman to woman depending on our dreams and aspirations. Just because my mother is the perfect housewife and can cook like a dream, it doesn’t have to mean that I have to do the same. Unless of course I want to. It is perfectly okay for me to aim for different things as we are different people. But I need to come to terms with it and accept the tradeoffs I have to make. Equally important is to share this with the relevant stakeholders, be it your family or manager, so that there are no surprises. For example, in my case, I prefer to outsource the cooking and housekeeping so that I have time to focus on work. Similarly on the work front, I have set clear expectations that the weekend is family time and I would not want to be disturbed unless there is a major emergency. The fact is you cannot have the best of both worlds… in fact no one can, be it man or woman. A good work life balance however is absolutely possible, but we have to make some tradeoffs. Men do it too. But we women tend to worry more about it and fall into a guilt trap. Don’t. 4. Find something you are passionate about. Find a job that challenges you to be the best version of yourself. I was lucky that I found my passion and perfect company early in my career. But most people may not be that lucky and it takes time to find the perfect job. And, that is okay. Just don’t stop looking out for the opportunity and when it comes, seize it with both hands and give it your best. Nothing can substitute hard work. Be the best in what you do. 5. Once you are in the workplace, leave the gender out of the equation as much as possible. Work hard, work smart and don’t expect different treatment because you are a woman. Step one to equality is believing you are equal and deserve the same treatment, compensation and rewards as men. That said, we do have strengths and weaknesses that are different from men. Be aware of these and be comfortable in your own shoes. The workplace needs different skillsets and our way of thinking and approaching problems can be a huge asset if used right. 6. Yes, it is a fact that if you are a professional woman, you will have to work a little bit harder than your male colleagues to prove yourself. So be it. Hopefully one day it will change, but till then, don’t waste too much time fighting it or using it as an excuse to get demotivated. Work hard, work smart, deliver results. And we will be able to make it much better for the next generation. My strong advice to all professional women is, “do not give in to the victim mindset”. 7. Being surrounded by men at work doesn’t mean you can’t shine. A lot of women complain that there are too few women, especially in male dominated areas like IT. If you are the only woman at the table, use it to your advantage. Chances are you will be heard more. So work hard to be prepared and to make the best use of it to get your ideas heard. 8. Celebrate your accomplishments. I find that a lot of women are not comfortable taking credit for what they have accomplished. We need to stop selling ourselves short. Yes, don’t become obnoxious and obsessed with ‘me and myself’, but when you have done something well, put your hand up and acknowledge it. If done right, it earns you the respect of your peers and managers as they know what you are capable of. 9. It is not just OK to be ambitious, but it is a necessary ingredient for success if you want to climb the corporate ladder. To get a job you have to show you are interested and that you want it. Time we accepted that ambition isn’t a bad word. To me, being ambitious is what keeps me on my toes and continues to drive me to be the best version of myself. It also increases the hunger to do more. 10. You cannot achieve our goals by accident. You need to plan for it.. Dreaming of more is one thing. But working towards making that dream a reality is another and where a lot of women fail. If u want to progress in your career, be clear about what you want, where you want to go, by when and put it down in what we at Intel call a development plan. It helps you structure your thoughts by listing down your short term and long term goals, understand what are the strengths that will help you do the job and what are the gaps that need to be addressed. Extremely important for professional women to have a real plan as against leaving it to chance. It shows seriousness and intent. 11. Communicate. Communicate. And, communicate. A development plan is only effective if you use it to have a career discussion with your manager. Tell them what your goals are and that you are serious about it. The best way to show intent is by talking about what steps you need to take to be ready for the challenge and what development help do you need. It makes the discussion very real. If you don’t tell you manager what you want, chances are they will not know. And even higher the chances that your male colleagues would have had that discussion many times over. So when the opportunity opens up, your manager will look at people who are not just capable, but also interested in the job. Don’t get left out because you were too shy to tell your manager what you wanted. 12. Invest time in building your networks. Networks act as your support and learning system at work and can tremendously help enrich the professional journey. Take the initiative to find mentors and sponsors who can help you develop the right skills needed to achieve your professional goals and also provide you with the right opportunities to increase your visibility and impact. A great advice I had received is “Don’t look at networks and mentors as only a way to get ahead. Look at it as a tremendous learning opportunity as you will connect with likeminded people who can share their experience and learning with you.” And no, your mentors and sponsors don’t have to be all women. Find the person you can learn the most from. 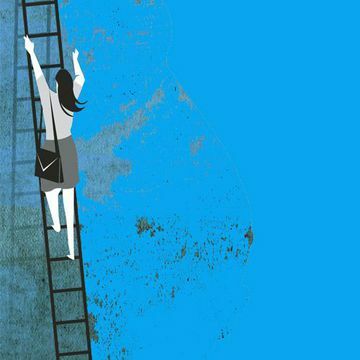 Yes, we women face a lot of external challenges when it comes to professional success. But the biggest challenges are the walls we build in our mind. We are often our worst enemies, as we constantly doubt our own abilities and intensions. If we get rid of the demons inside our heads it will be much easier to deal with the external factors. Start thinking positively about yourself, start appreciating the qualities you’ve, start appreciating the dreams and aspirations you have and give yourself a chance to make a difference. If we allow ourselves, we can do a lot. Here’s to a successful, productive, enlightening journey for all of us. Yes, we have to learn a lot, work harder and yes, at times we have to face the infamous glass ceiling. But as I always say, the best thing about a glass ceiling is that it’s made of glass. And glass can be shattered. Just believe you can do it. We have come a long way, but there are miles to go before we sleep - to ensure that the next generation does not have to go through the same struggles. Let’s believe in ourselves and in our ability to be the best and let’s give ourselves a chance to make a difference. The right question is not whether I can do it; but whether I WANT to do it! The article was also published in DNA.